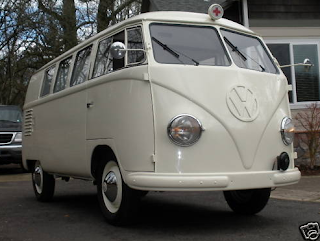 A 1953 "barndoor" bus Krankenwagen (ambulance) with 23,000 original miles on it. 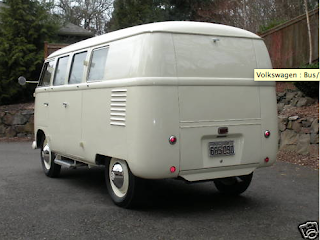 Barndoors (manufactured from 1950-55) are special as they are the earliest VW Type 2 models and feature a very large engine compartment opening, hence the name. 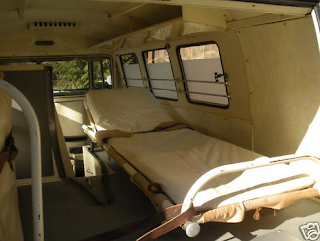 However, as an ambulance, the size of the rear hatch was increased for easier ingress/egress, reducing the size of the engine lid. This particular bus allegedly spent it's life at a Swedish explosives factory from 1953-83. Always stored indoors and only used in emergency situations, it's a fantastic survivor. But with only 25 HP in it's original configuration, it wasn't the fastest means of transporting the injured. But hey, what's the rush anyway? At least the patients would be going in style, right? I'd remove the stretcher for safe keeping and use it to carry either bicycles or surfboards. Too bad the price is waaay out of my league, with it sitting at $24,000 as of this post. Bid now on eBay. Update - auction ended 3/7/10, did not meet reserve at $30,100. And you know where the Krankenwagen takes you? To the Krankenhaus of course! Seriously. I'd prefer the Krankenhaüß. Looks more-exotic. And tougher.